The Pittsburgh Steelers made several roster moves last Thursday ahead of the start of the start of Organized Team Activities (OTAs), which will get underway on Tuesday (May 23) at the UPMC Rooney Sports Complex. The Steelers waived long snapper Greg Warren and tight end Ladarius Green. Both received the designation of Failed Physical as part of the roster moves. Warren, who spent 12 years with the organization and was one of only three players remaining on the roster from the Super Bowl XL championship team. Warren saw action in 181 career games and provided stability on special teams. Pittsburgh used the 213th overall pick in the sixth round of the 2017 NFL Draft to select Colin Holba out of Louisville. Green’s release marks the end of his frustratingly abbreviated career wearing the black & gold. Green signed with the Steelers in March of 2016 as the apparent replacement for the retired Heath Miller. After spending his first four seasons in the league with the San Diego Chargers, Green agreed to a four-year, $20 million deal to come to Pittsburgh. Green was coming off ankle surgery when he agreed to terms with the Steelers, however, and was placed on the physically unable to perform list when the team opened training camp. Per the Pittsburgh Post-Gazette, though, sources indicated that he was also being kept out of action due to headaches, and he was not activated to the active roster until November. He played in six games, catching 18 passes for 304 yards and a touchdown. 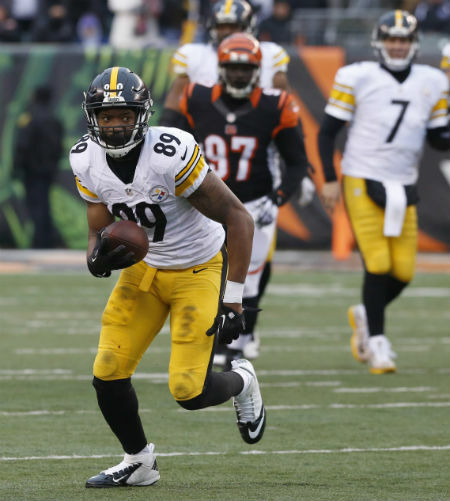 Green was diagnosed with a concussion after hitting his head off the turf at Paul Brown Stadium in a 24-20 win over the Cincinnati Bengals on Dec. 18. It proved to be his last game as a Steeler. With Green gone, the Steelers are now left with Jesse James, Xavier Grimble, David Johnson, Phazahn Odom and Scott Orndoff at tight end. James caught 39 passes for 338 yards and three touchdowns in 2016 while Grimble grabbed 11 receptions for 118 yards and two touchdowns. Pittsburgh did not spend any of its eight 2017 draft picks on a tight end. In addition to waiving Warren and Green, Pittsburgh also signed running back Terrell Watson. Watson, who went undrafted out of Azusa Pacific, has spent time on the practice squads of the Bengals, Cleveland Browns, Denver Broncos and Philadelphia Eagles.